I wish you all blessings for a joyful year full of nurture, peace and love. Today is the first day of the Year of the Wood Horse. Because the Horse element is fire and this year’s element is wood, it is considered an auspicious interaction: wood is the mother to its fire child; that is, wood will nourish a fire, so it indicates a generally good luck year. This is a YANG year; that is, it is full of outwardly directed masculine energy that is very active. The wood element suggests a time of growth, of working on and developing current projects, and a horse year is full of activity and forward motion, so this year is one of great activity and the potential for transformation – galloping into the sunset, so to speak. However, this year contains many YANG-heated elements and it will be very easy to get burnt or to suffer burnout. You must be careful not to burn up all that precious growth wood energy early in the year or you might find yourself in the midst of an out-of-control fire before the year is out! You need to reign in that horse and keep it firmly in control, carefully pacing out the year, using your energy with a focussed awareness. For your spiritual practice it indicates a year of positive growth and development in your current practice, which will lead to a sense of satisfying progress. It is the Springtime of your practice where you have laid the foundations and now you can really move forward and experience some sense of achievement in your practice. Wood indicates growth and fire indicates transformation, so these are very productive elements for spiritual maturity. However, because this is a very YANG hot year, if you just go headlong, feet-first into your spiritual practice, without taking time to add periods of quiet, inwardly focussed activities that will keep you in harmony, then you will burn up the opportunities presented by the year’s energies before you reap its promising rewards. In Tibetan Buddhism, the horse represents our soul, or rather our life force vitality, and is called Lungta, which means “Wind Horse”. This horse represents our innate enlightenment and our unlimited capacity for love and compassion. When this horse is strong, then our vitality enables us to transform, when it is weak, then we feel flat and discouraged. 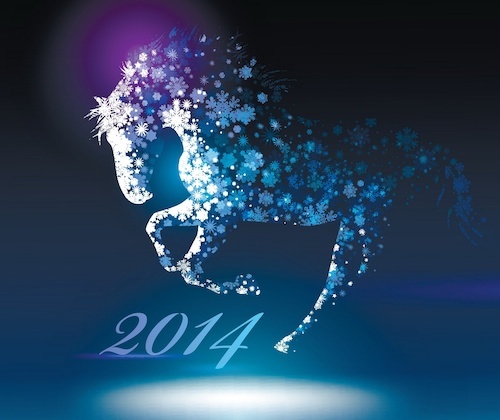 So this year of the horse gives us energy to transform and feel really alive. During the year of the horse, if you do find yourself feeling overwhelmed or overdoing things, take time to sit quietly and take a few deep breaths. 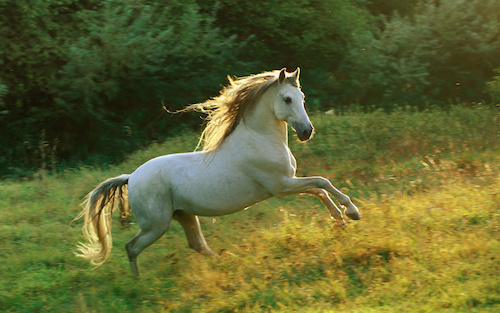 The wind horse is there to help you this year, so meditate on the image of a white horse galloping gracefully and effortlessly through a spring meadow full of flowers and on into the cool forrest, where the trees are green and flourishing and nurturing. The wind horse is full of vitality and freedom, so if you ride that horse you too will feel its strength and power, carrying you on. The horse is full of energy but galloping is natural and effortless, and so it should be too with the energy you focus on all elements of your life. This is a very empowering image and will help to encourage the positive energy that comes with the Year of the Wood Horse and its potential for profound transformation. This entry was posted in Buddhism, Spirituality and tagged astrology, horse, lungta, wind horse. Bookmark the permalink. May the New Year of the Wood Horse woosh you up in it’s wonderful wings of Joyfullness, Inspiration and gentle Lightness.. Liked your writings on the Wood Horse very much Cate. Already feeling that Yang energy! Have been helping a friend move house.Always a delight. But we worked like ‘Trojans’ and laughed out loud (at the silliness of stuff). But with great energy we had everything moved, cleaned and sparkling before we knew it.